Brooks Charles Gordon (1920- ) American political cartoonist born in Andalusia, Alabama, on November 22, 1920. 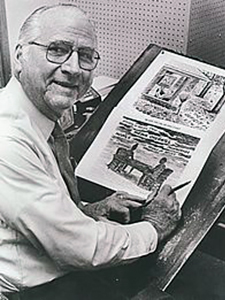 Chuck Brooks was educated in local public schools and attended Birmingham Southern College, which he left in 1941 to attend the Chicago Academy of Fine Arts. In Chicago his teacher, Vaughn Shoemaker, taught him editorial cartooning. Brooks enlisted in the army and won four battle stars for action in such campaigns as Normandy. 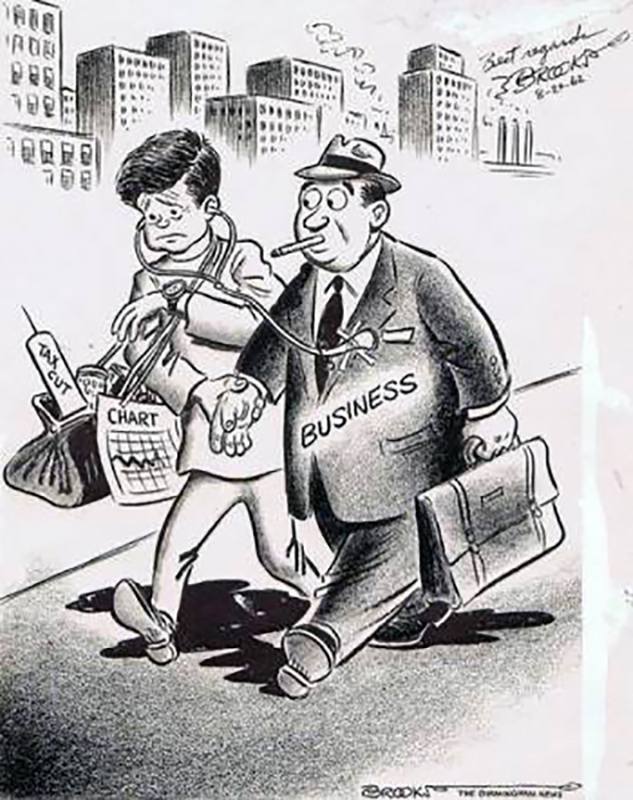 After the war he freelanced in Chicago for a year, married and returned to Alabama, where he became editorial cartoonist on the Birmingham News in 1948. 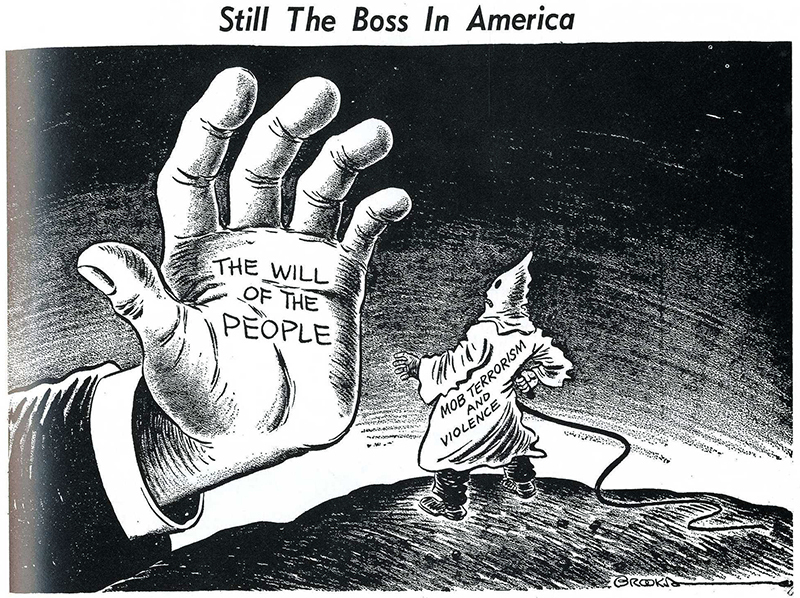 He remains there today as one of the South s strongest political cartooning voices. Traditional-style figures and conventional crayon shading have been Brooks’s visual forte throughout his career. In concepts he is strong and has always vigorously upheld the Southern point of view. One of his frequent themes, and one most tellingly presented, was of Northern hypocrisy during the desegregation years. Politically, Brooks is an independent with definite Republican-conservative leanings. Brooks has won ten Freedoms Foundation awards, the Sigma Delta Chi Distinguished Service Award in 1960 and the Grover C. Hall Award for Excellence in Alabama Journalism from Troy State University in 1974. 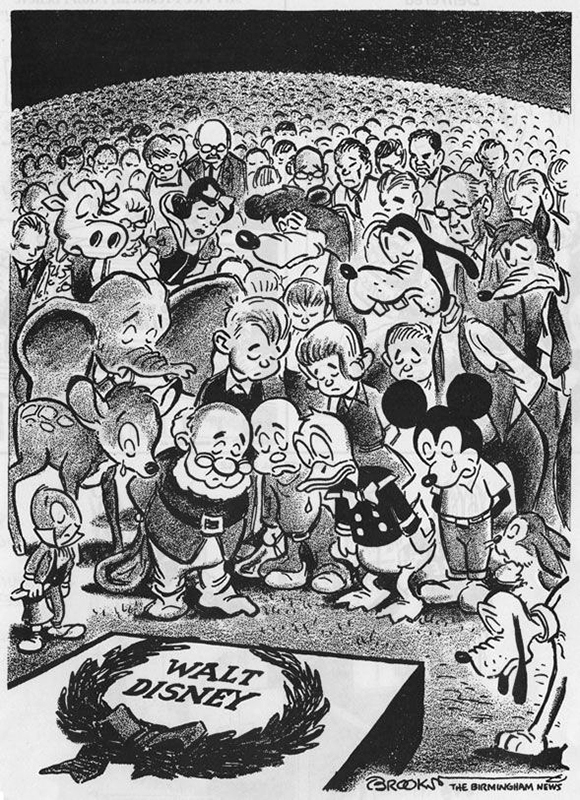 He also edits annual compilations of the best American editorial cartoons.